Mum says she is pooped and worn out, something about ending a quarter. She is happy tomorrow is Friday and the end of the week. We are trying to get her to rest more, she spent way too much time on her work puter tonight doing stuff and typing and typing and typing to all sorts of people. She did get a bright spot this week, she got surprised with some flowers at work from a sales manager for helping his team out. She didn't bring them home so Derby can't eat them! I got mum. She was expecting me to burrow under the blankie, I jumped over and pounced on her hip. HARD. Hiya, Ducky here. Hope everyone had a good weekend. We watched mum work on the new 'puter. It is pretty much set up. When she got it, she had the shop transfer all of our pictures, moovies and such. Then she didn't have to take all that time, so that was the easier part. She got the programs on it that she needs as well and is slowly learning the new version of stuff. She does not like the new email or the video maker either! She figured out how to do the videos below in the Flip video program. The windows thing was making her head hurt. On to more important things like me! I am doing just fine. No issues in the past few weeks and no idea of what made me have a fever. I am all better now and the video proves that. Mum was in and out on Caturday. The most important thing she did was to go visit furiends who just got a little girl last month from South Korea. Her name is Jianna and her gotcha day is mum's purrthday. When she came home she finished her housework, then readed her book. I watched. Derby trying to get at the treat jar. Mum got this new little jar to hold our treats, Derby can't chew on it and we haven't been able to open it yet either on our own. We will need to work on that trick. We know that others have had lots more snow this week like Scooby, Shaggy and Scout. But we are tired of winter, the white stuff keeps coming down. We wants warm and open windows. 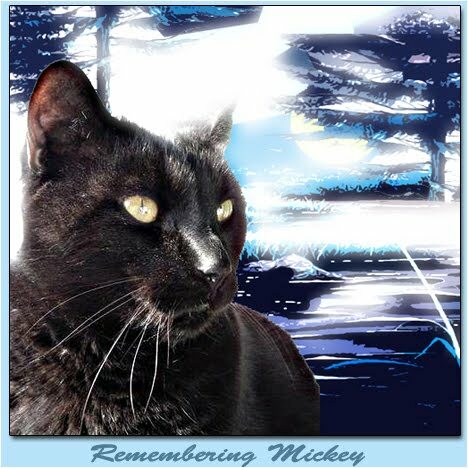 Plus Scooby, Shaggy and Scout have sad news about our old furiend Edsel and his family. If you amember them you can head over to their blog for the update. Spring is coming, the male goldyfinches are turning back to bright yellow, but are sort of half way turned so far. So week by week they are getting more yellow. Lastly huge PURRS to our little lady furiend Miss Sweet Praline. She didn't get good news at the VET last week. Purrs and hugs to her and her mum. We are chillin'. Really, it got all cold this week again. We even got a little bit of snow overnight. It all went away today, but still. We want open windows! We are taking up where mum normally sits. She booted us out so she could sit and play with her new toy. Seems the existing puter has been acting funny. Now she needs to get the new one all set up. That is what the weekend is for, so guess we won't be visiting much. She has both puters going right now, trying to figure out the new one. Getting the recovery disks done, programs installed etc. Hope all have a happy weekend. What are you afraid of if you have catoptrophobia? Mirrors or looking in the mirror! Not us kitties! Our snow piles in the back of the house on Sunday. These will be the last snow to go as they don't get much sun. But it is even much smaller now on Monday evening. Mum has watched small bits of the basketball tourney, mostly just the Bucky Badger games. She likes the fact that you can tune into one game and one game only. Then you don't get sucked into all of the other games. Ducky took time to sit in front of the moving picture box during the game on Caturday evening. We didn't get totally ignored that night. Mum went outside on Monday when she got home to check the fevver feeders. She didn't get the inside door all the way shut. So when she started to come back in and opened the outside door, I shot out! Mum was quick, she caught my tail! I hissed, but she didn't let go, then properly picked me up and 'poligized for pulling my tail to catch me. Plus I got lots and lots of treats. Mum agrees with us on this one. She sorta did the cat thing this past week. Rested lots, ate good foods, soaked up some sunshine. Today we sent her back day hunting. We did lots of this on a not sunny Sunday. It rained, thunderboomed a couple of times. Mum did the washy routine and finished reading her book. We didn't get to see the stouper moon, it was cloudy here. Bucky Badger lives to play basketball again next weekend. We are happy about that. We have a quiz for you. No fair looking it up, just guess. We are putting on comment moderation so no one will see the other guesses/answers. We will let you know tomorrow what the answer is. We are happy regardless what day it is. Mum is bummed as this mean her week off is coming to a close. When mum got home the other day it was nice, warm and sunny, so mum opened the windows for us and left them open all afternoon. Our video of getting the windows open. Our snow is disappearing pretty fast. The bit you see in the front of the picture is now gone! We can see more and more grass and less of that white stuff. Then next day wasn't as sunny but still pretty warm. Things are popping out of the ground, two-lips and daffs coming up. Plus Mr Chip Monk was running around on the patio too. Me looking out the window at mum. She just sat outside in the sun. Like us we thinks she is a bit solar powered. She has been smiling lots when she is outside in the sun. She watched a bit of the basketball tourney, Madness it is called. Our Bucky Badger won, so will play again on Caturday. Guess we will be watching. Here is where mum went off to rest for a couple of days. Near enough to drive to, but fancy enough. She got pampered while she was there, lots of sleeps, not doing too much, getting massaged, whirlpooled, toes and fingers painted etc, etc, etc. She got a package where all the pampering was included with the room, which save here green papers. Her balcony was the top one on the left, she went outside but didn't sit there long as it wasn't that warm yet. Hey, this is nice! A big bed! Why we could have gone along and we would have lots of room for all of us to sleep together. Phooey, mum says they don't allow kitties. Well they also don't allow woofies either, so at least so no discrimination! Even a tub big enough to have a great tub hockey match. Mum says she used it twice a day the days she was there. Nice an relaxing. Well we hope you all have a good weekend. We are part of Wordy Wednesday, thanks Ann at Zoolatry for the pictures. Well what other word would go to me other than SASSY. 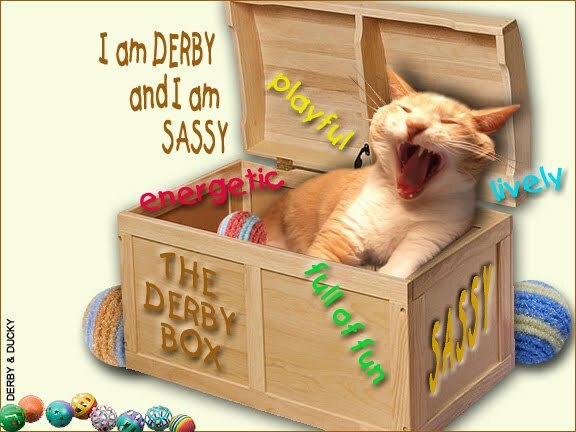 It is part of my name, Derby the SassyCat. Used to be on the blog header when I was the only one here! I can do the love bit too, at least when I want treats. 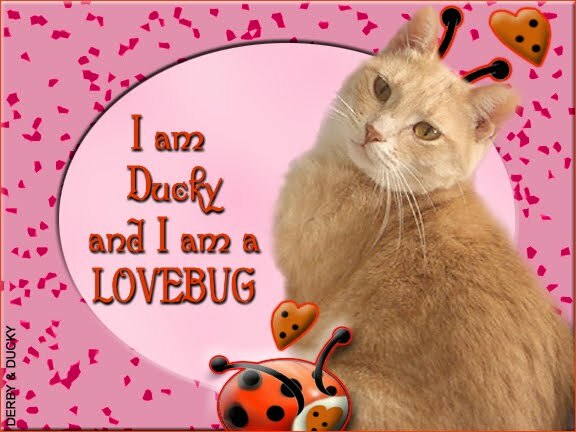 Well, he may be sassy but I know I am mum's LOVEBUG! I love to cuddle and sit on my mum all the time. I specially like to sit on her chest. Block her view of the puter, moving picture box and all. Although sometimes I can get a little, ahem, sassy. I turn and put my spot 13 in her face! I’m playing WWC2011 with The Cat Blogosphere! Go visit everyone else too. Plus mum will be home later today we thinks. The house is properly trashed for her. Thanks for stopping by and helping out with that. Awefully quiet here today. Mum got out her bags and packed all sorts of stuff and took off yesterday afternoon. She doesn't normally leave us for long, and we have lots of food and water out. So we should be OK. But hey, is she skipping out on day hunting? It's Monday! The runt is really feeling better. Yesterday morning he jumped up on top of the corner cupboard like he did here. Then he walked along the window valance too. He did this while mum was still here. When he jumped down he jumped and land on the puter printer. Mum was not happy about that. Me, I was spending my time in the front windows toasting myself in the off and on sunspots. When one side got warm. I flipped to get the other side all toasty too. Yes, the runt and I do get along, at least some of the time. At least we try to make it look good for mum at least occasionally! Hmmm, since mum isn't here, everyone is welcome to come over. HOUSE TRASHING PARTY starts now! One of our good furiends has decided it is time to head for The Bridge. Fond farewell to you Mickey, we will meet again some day. Kinda quiet for a Caturday at home. Mum is just doing a few quick things, ran around with the sucking monster after she took the extra litter box back to the dungeon. Dang, we like having the box in her bathroom. But she doesn't like the grit on the floor! We are seeing more spring birds today in our yard, even with the snow on the ground. One robin, two red-winged black birds and five grackels. It is cloudy, windy and melty today. Mum says not nice enough for open windows but maybe sometime this coming week. Whoohoo to that. I am so privileged to get this award for the second time. I was specifically given to me, not to Derby. It was passed on to me by Herman of Herman's Hideaway. Thanks Herman. 1. I love to play with most any toy and I have lots of toys to choose from here. 2. I chirp and squeek more than meow. I only meow if I get put in the PTU. 3. I am a jumping fool. I can jump high and have jump up on top of mum's corner cupboards and on to the wooden valence over the front windows. See me strutting my stuff! 4. I haven't been outside of the house except in the PTU or our porch thingy since I got here over a year ago. 5. I am not good a burying things in the litterbox! 6. I love to mooch string cheese bits from mum. 7. When mum comes home I like to sit under the bench for her to find me. It is hard to think of another seven things about yourself since I did this a couple of weeks ago. Plus again, I will hand this out to anyone who wants it. Go for it guys. 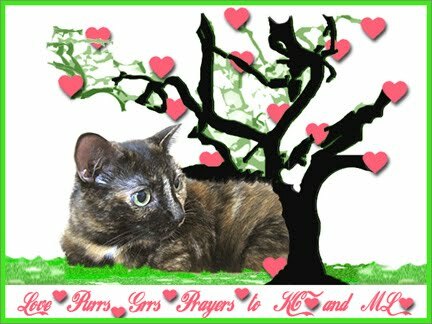 We want to send out lots and lots of purrs to KC and her mum ML. KC is feeling poorly and her mum is worried about her. We know all about kitties not feeling well and worried mums! KC is our wonderful re-purr-ter on the CB. Without her we wouldn't know much of what is going on in the CB! No we aren't sure what caused Ducky to have a fever. There were no obvious wounds that might have been infected. Mum had given him the once over at home and the VET did the same thing at the office. No tummy troubles or other output troubles. The VET office even called us to get an update on how things were going. Mum said fine. So things seem to be back to pretty much normal for now. So we are sending out our purrs to KC and any other kittie who needs them. Hiya Ducky here. I is feeling better, thanksc for all of your purrs. It was a couple of some not so good days as mum thinks this may have started on Wednesday, but got worse on Thursday. Mum took me to the VET on Friday, they weighed me and I had lost nearly a whole pound since my checkup three weeks ago. They gave me subQ fluids and after a couple of hours I was getting back to my normal self. Mum kept me and Derby apart, just in case what I had was catchable AND so I could have some peace to rest and get better. Friday night mum spent most of the evening with me on her sleepy spot. Hey, I see you missed some spidey webs up there when you cleaned last weekend! Yeah, scritches, we all love scritches. Mum could tell as the evening went on I was doing better. I began to eat more and drink more too. I started to jump again, a little tentative at first but improving as the evening went on. On Caturday mum kept me away from Derby. She was in and out during the day. She had the ususal shopping to do. The took herself to the moovies and saw The King's Speech. She liked it and said she could tell why it won so many awards. She gives it the thumbs up and to go see it if you haven't. Caturday evening I posed real nice for mum . She had moved into the sleepy room with me for the evening. She watched the 25th Anniversary Concert for Le Miz. She was sort of singing along, thankfully not too much. I kept her in place by sitting on her most of the night! And this is what she woke up to on Sunday morning. Get going sleepy head, the sun is up, fill up my dish of noms! I posed one more time on Sunday morning. Then once she was all dressed she opened up the doors and Derby and I could interact again. A bit more chasing / hissing and such for the first few hours, then we settled down. If I really wanted peace and quiet, I just went back to my hidey spot for a while. But I was out in the rest of the house too. I came to help mum with a big file for work and sat on her chest while she worked. CrashCar was on in the background. I have my pills to take, but she doesn't shove a pill at me. But I have been getting a little bit of tuna every evening with some fancy sprinkles of yellow on the top. Derby is around, but he isn't too swift on the concept of the TurboTrak. It isn't made to be sat on, you gotta make the little ball move. Sheesh, such a simple concept that he cannot seem to master. Again, thanks for all of your purrs. I am pretty much back to normal. Phew, long post, I gotta rest now! No pictures from the VET, which is OK. Mum took me to the vet late this afternoon. I wasn't moving much, it was an effort to do that. Mum came home early from day hunting, she came in to check on me and brought the carrier in with her. I headed under the bed. She just said hi, then left for a while. Said she had to take paperwork to the courthouse. When she came back, I wasn't under the bed and she just sat and gave me scritches. Then gently got me into the carrier. She even included my soft bed. Once we got to the VET, the first thing he did was stick something up my spot 13! Guess I needed it as read 104! Way higher than a kittie should have. So I got some fluids with aunti-bio-tics and aunti-inflamatory stuff in in. Plus pills to give me for the next week. Said to see if I perk up, if not come back they will do blood work. Mum says I am giving output and the VET could tell my bladder wasn't full. So that is where we are at for now. I am back resting in my little bed next to mum's bed. Well I came out for a while both last night and tonight to get some treats. Mum did put a small dish with food in my hidey spot. You can see me sitting on the other end of the couch last night. Derby was just on the floor, you can see my tail and a few small pieces of treats still to eat. Tonight when mum came home I was on the pod with the ginger gizzy on it. Mum is noticing that I am not jumping like I used to. Tonight she was sitting on the edge of the bed changing her clothes, I jumped up on the bed, but wasn't really good at it. I barely made it from the floor to the bed. In the top picture I was thinking about jumping up to the back of the couch, but didn't. I went back under the hidey spot, Derby can't jump on me there. Also mum says she is worried and will calling the VET man about seeing me. Mum Update: I am worried, Ducky doesn't seem to have the freedom of movement that his has had. He seems if he is standing to always want to hunch his back in the "scardy cat" pose. I watched him go from a standing to sitting position tonight. His movement wasn't free, he seemed to try to sit several times before he actually sat. Derby has been chasing him more, maybe some harder wrassling, so maybe Ducky got landed on or twisted his spine. Will call the vet in the AM and see when I can get him in. They usually have a few spare appointments later in the day or Saturday AM. Think I may confine Ducky to my bedroom and bath. Bring up a litterbox and put his food bowls in there so he can be safe. Sheesh, I don't know what has gotten into Derby the past week. He is picking on me more and more. Jumping on me squishing me, chasing me all over the place. Lots of hissing back and forth. Mum says to ignore him, so I am spending more of my time under here. Plus I sleeps with mum all night and make sure she is nearby, otherwise I do my best to stay away from him. Shhessh, I though we were doing OK with tolerating each other. I have been here over a year, he should be used to me!